Italy has nearly 3,000 troops currently deployed in Afghanistan. Rome, Italy (CNN) -- The Italian government plans to participate in the international troop buildup in Afghanistan by sending 1,000 more troops there next year. The Italian Defense Ministry confirmed the troops would be deployed in the second half of 2010, a complement to the nearly 2,800 Italians already in the western part of the country. Italy is one of 43 countries serving under the NATO-led International Security Assistance Force. Based in Herat, the Italian military is the lead nation in ISAF's Regional Command West. 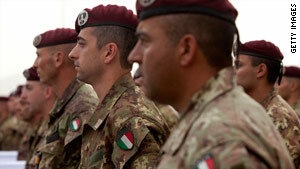 22 Italian service members have been killed in the Afghan conflict. The Italian escalation would be part of the troop buildup of 5,000 extra non-U.S. service members ISAF intends to commit to the country. NATO Secretary-General Anders Fogh Rasmussen has said that new troop pledges could be announced at a conference of NATO foreign ministers Thursday and Friday in Brussels, Belgium, where the alliance is based. There are currently 42,000 non-U.S. NATO troops in Afghanistan at present. 28 NATO allies and 15 non-NATO members are contributing to the U.S.-led coalition. The added NATO troop deployment would complement the nearly 100,000 Americans expected to be in the fight once the 30,000 troops U.S. President Barack Obama announced Tuesday night are in place.